In this edition of the HeartCry magazine, we will reflect upon two important truths regarding the Great Commission. First, we will consider the primacy of the gospel in all missionary endeavors. To “do” missions correctly, we must recognize the great importance of the gospel, seek to comprehend its contents, and train ourselves to clearly proclaim it to others. 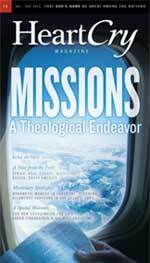 Secondly, we will consider the theological or doctrinal nature of missions. The Great Commission is primarily a theological or doctrinal endeavor. It is not about sending missionaries, but about sending God’s truth through human instruments. For this reason, the missionaries we send must be diligent to present themselves approved to God as workmen who do not need to be ashamed, handling accurately the word of truth (II Timothy 2:15). As is commonly known, the word “gospel” comes from the Greek word euangélion, which is properly translated “good news.” In one sense, the gospel is found on every page of Scripture; but in another sense, the gospel refers to a very specific message – the salvation accomplished for a fallen people through the life, death, resurrection, and ascension of Jesus Christ, the Son of God. In accordance with the Father’s good pleasure,  the eternal Son, who is equal with the Father and the exact representation of His nature,  willingly left the glory of heaven, was conceived by the Holy Spirit in the womb of a virgin, and was born the God–Man — Jesus of Nazareth. As a man, He walked on this earth in perfect obedience to the Law of God. In the fullness of time, He was rejected by men and crucified. On the cross, He bore man’s sin, suffered God’s wrath, and died in man’s place. On the third day, He was raised from the dead. This resurrection is the divine declaration that the Father has accepted His Son’s death as a sacrifice for sin: the penalty for man’s disobedience has been paid, the demands of justice satisfied, and the wrath of God appeased. Forty days after the resurrection, the Son of God ascended into the heavens; sat down at the right hand of the Father; and was given glory, honor, and dominion over all. There in the presence of God, He represents His people and makes requests to God on their behalf. All who acknowledge their sinful, helpless estate and throw themselves upon Christ will be fully pardoned, declared righteous, and reconciled to God. This is the gospel of God and of Jesus Christ His Son. One of the greatest crimes of this generation of Christians is its neglect of the gospel, and it is from this neglect that all our other maladies spring forth. The lost world is not so much “gospel hardened” as it is “gospel ignorant,” because many of those who proclaim the gospel are also ignorant of its most basic truths. Absent from too many pulpits at home and on the mission field are the essential themes which make up the very core of the gospel: the justice of God, the radical depravity of man, the blood atonement, the nature of true conversion, and the biblical basis of assurance. In many cases, the gospel message has been reduced to a few creedal statements, conversion has become a mere human decision, and assurance of salvation is pronounced over anyone who prays the sinner’s prayer. This is a great crime. 'Missionaries are primarily “gospel bearers.” Therefore, they must make it their great priority to know the gospel and to know how to proclaim it correctly to others. Missionaries carry with them the gospel seed that will grow into the root that will spread out as branches bearing fruit among the people to whom they have been sent. It is frightening to think that the seed we carry may not be pure, resulting in the fruit of death rather than the fruit of life! A missionary’s stewardship of the gospel is of utmost importance. Therefore, before we launch out in zeal, we must be sure that we are grounded in the truth! Do we really know the gospel, or have we simply learned some method of evangelism? Many today see the gospel as Christianity 101 that can be learned in a few hours or days. Such a view betrays an ignorance of the gospel. It is the greatest and deepest revelation of God to man! After a lifetime of study, the greatest mind will not even have reached the foothills of this great Everest of the Christian faith! In fact, after a thousand eternities there will still remain much to be learned about the gospel! At the risk of sounding too severe, the following must be stated: A person unschooled in the gospel of Jesus Christ has no business on the mission field. The missionary with a superficial view of the gospel is the great bane  of the Great Commission. The didactic nature of the Great Commission and the extreme importance of a right understanding of the gospel’s contents naturally leads us to the following theme: Missions is a theological or doctrinal endeavor. As we have already stated, the Great Commission is not about sending missionaries, but about sending God’s truth through missionaries. Jesus commanded the church to make disciples by going, baptizing, and teaching! Therefore, all the sending and all the missionary activity in the world is of little value unless the ultimate result is the promulgation of biblical truth, resulting in the transformation of lives in accordance with the revealed will of God. In past ages of the church, theology was considered the queen of all sciences, the highest and most worthy occupation for the human mind. However, in recent years, theology and anything that has to do with doctrine has fallen upon hard times. Doctrine is not just ignored, but often disdained, and not only by liberals, but also by those who claim to be Bible-believing conservatives. Furthermore, doctrine is no longer seen as the foundation of unity, but as the great divider of the church and the poison that puts sincere believers at odds with one another. Finally, biblical doctrine is even frowned upon by some missionaries, who see it as dangerous unless it is first carefully strained through the filter of cultural sensitivity. How did it come to this? The answer is rudimentary and ancient. The serpent of old – who asked our first parent, “Has God said?” – is at it again. He has fashioned our culture into one that not only rebels against the truth, but even denies that the truth can be known. However, his deception has not stopped at the borders of secular culture. The plague has passed over into the land of Christendom and contaminated our fields also. For too long the church has grazed on the deadly weeds of relativism, which denies the possibility of absolute truth, and humanism, which makes man’s opinion and culture to be the standard of all things. Throw into the mix an absolutely absurd view of tolerance, and you have a situation in which belief in the truth and the proclamation of it is scorned as imbecilic at best and immoral at worst. First, it has become popular opinion that doctrine or theology divides believers and destroys heartfelt passion. However, those who hold to such opinions fail to realize that “doctrine” is just another word for teaching, and “theology” literally refers to a study of God. Should we banish these disciplines because not all agree? Furthermore, we should realize that all men are theologians (i.e., all have some opinion about God). It is just that some are more diligent than others to study the Scripture and to abandon their own opinions in favor of God’s truth. Finally, is it really possible that a greater understanding of the person, work, and will of God is destructive to the soul and the enemy of heart-felt passion? Theology and doctrine are not the problem. The problem resides with the bad theologian and his bad theology! Secondly, it has become popular opinion that Christians should lay aside their doctrine and unite around their common faith in Christ. However, the harsh reality is that there are many different versions of Christ being proclaimed on the earth today by those who claim to be His followers. How can we distinguish the true Christ from the multitude of false christs except through a careful study of the Scriptures and a faithful application of its doctrine? Are we to preach a Christ to the nations that is so general or vague that we fill the world and the church with countless contradictory opinions regarding His person and work? Unity cannot logically be founded upon our common confession of an undefined Christ and contradictory opinions regarding the fundamentals of the Christian faith. Thirdly, it has become popular opinion that Christians should lay aside their theology and unite around the common cause of the Great Commission. However, the Great Commission is primarily a theological endeavor. To lay aside theology in order to advance a theological endeavor is logical suicide and destructive to both. It is absurd to think that the Great Commission can be the thread that binds together individuals who differ in major tenets of doctrine. Unity must be based upon a common view of who Christ is and what He taught. Fourthly, it has become popular opinion that Christians should only concern themselves with agreement regarding major doctrines and not sweat the small stuff. There is some truth to the famous quotation: “In essentials, unity; in doubtful matters, liberty; in all things, charity.”  However, there are also some inherent dangers. One of the most serious problems has to do with the current trend in Christianity which increasingly depreciates the importance of absolutes. As this trend continues, Christians relegate more and more doctrines to the “small” category. Doctrines that were previously held to be absolute essentials are no longer considered worth arguing about. Another problem has to do with the practical realities of real life ministry. Being unconcerned about everything except the absolute essentials works fine if you are meditating in an ivory tower or philosophizing with your friends in the seminary student center. However, when you begin to plant a church, or when you begin to disciple real people with real questions, those small matters of doctrine become extremely important and demand definition. 17 The term “bane” comes from the Old English word bana which referred to a thing which caused death or a poison. It refers to any cause of great distress or annoyance. 19 Although commonly attributed to Augustine, there is much debate as to the actual author of this famous quote. It is interesting that this quote is cited by “a dizzying variety of incompatible Christian traditions” (Web article posted by Steve Perisho, http://www9.georgetown.edu/faculty/jod/augustine/quote.html). 20 “Today’s Gospel, Authentic or Synthetic?” By Walter Chantry and first published in 1979.